It’s official – it’s time to stripe up your life! Multi-colour stripes are the hottest trend for Spring and Summer right now. Stripes are everywhere and as we transition in to Summer bright colours are making an appearance too. I found this cute multi-colour striped maxi at Forever 21 and it makes me so happy! I love the bright, bold colours on this dress. The wrap style of this maxi allows to you adjust it to fit perfectly. The straps are also adjustable and can be loosened or tightened as desired. The dress drapes well and is fitted at the top with a bit of flare a the bottom. It literally flows with you when you walk and it’s so much fun to wear. You’d definitely be tempted to twirl in this dress, I sure was 😉 For some reason multi-colour or rainbow stripes make me think of the circus, perhaps the bright colours you’d see on the big top? I was equally thrilled to find a pair of earrings that matched the colours in the dress perfectly! 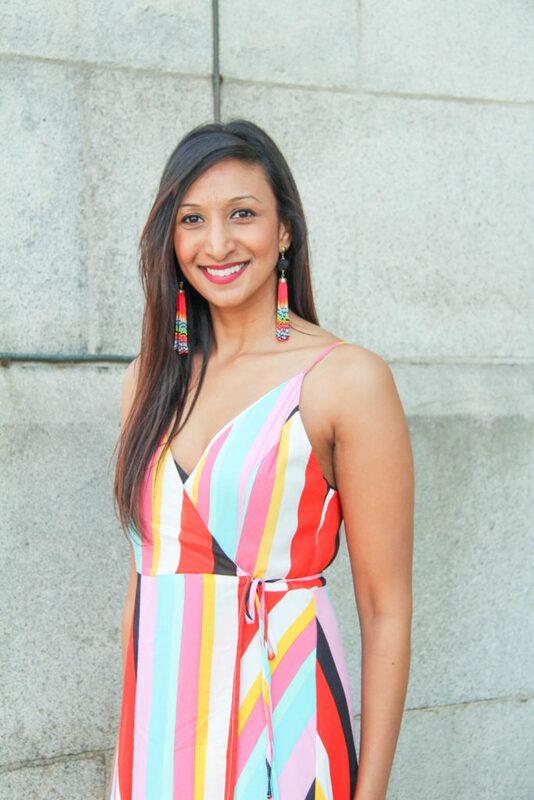 My beaded duster earrings (also from Forever 21) cost under $10 and add to this fun and colourful Summer look. To finish off this look I added a pair of majenta block heel sandals. I think this look would be perfect for dinner alfresco at a bistro or for a fun summer event or concert. To convert this outfit to a festival look you can dress it down by opting for flats instead of heels or even a slip on sandal. What do you think of bright colours and bold stripes for Summer? Is it a hit or a miss? Two trends I’ve been seeing this Spring are gingham and two piece sets. I find gingham is a print that is evergreen. It never seems to go out of style, granted it has its seasons of appeal. Every Spring and Summer however gingham is back in style. I’m also seeing a lot of two piece sets in stores, that’s why I was thrilled to find this outfit from Simons that combines both of these trends. When worn together the shorts and top give the illusion of a one-piece or romper which is one of the things I like about this outfit. However you could wear these items separately as well and pair the top with some white jeans or the shorts with a white shirt. 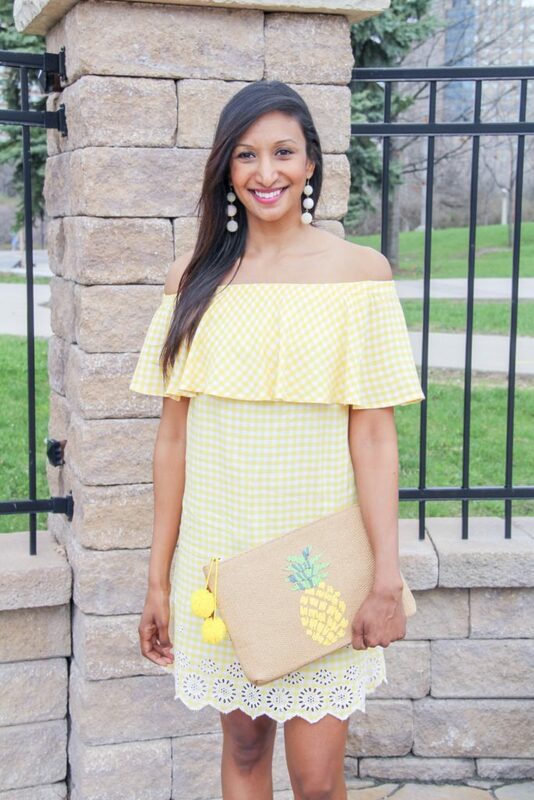 To accessorize I added some white fan earrings and my Shiraleah straw clutch. For a casual day time look I wore a pair of white wedges but you can dress this outfit up by adding some strappy sandals for a more formal look. What do you think of the gingham trend this Spring?